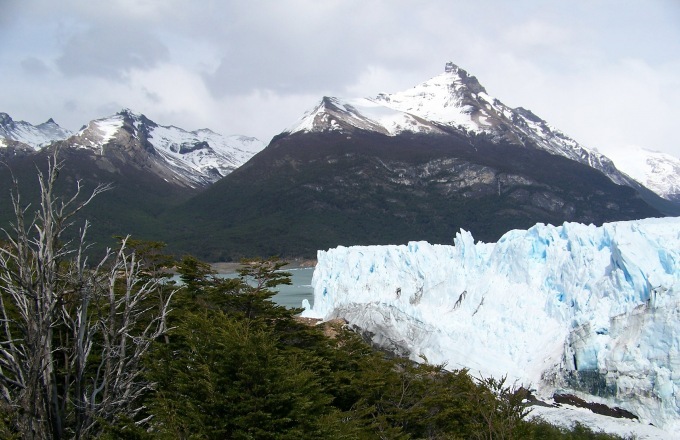 The Los Glaciares National Park is an iconic Patagonia landscape. On this trip you'll sail across a lake to view ice calving off a glacier and trek to view the Fitz Roy Range and the Cerro Torre. Accommodations are in El Chalten and in El Calafate in comfortable lodges. This trekking trip is a perfect complement to a visit to the Torres del Paine Park in Chile. Upon arrival in El Calafate a local guide meets the group and give us a general explanation about the trip while we have lunch; after this we have a couple of hours to explore the town. From the bus terminal we embark on an approximate 4 hour regular bus ride to El Chalten. The drive is on isolated dirt roads along the northern end of Lago Viedma. El Chalten is a tiny outpost beside the National Park at the foot of the impressive Mount Fitz Roy. We do a full day hike along Cerro Torre Trail to Laguna Torre, a mountain lake with majestic Mount Torre in the background. We stop at different points to take in the magnificent view and enjoy a picnic. Later, we return to El Chalten following the same trail. There's an optional day trip for those wanting to trek on Torre Glacier. Those taking this exciting option get up earlier and do it apart from the main group. Upon returning from the trek, the evening is free to enjoy a delicious dinner at one of El Chalten's cozy restaurants. Today trek to Laguna Los Tres with the best available view of Mount Fitz Roy. We follow the Fitz Roy Trail up to Rio Blanco, passing Poicenot, the mountaineering camp. Finally, a short but steep trail will take us to Laguna de Los Tres. The turquoise-blue of the Lagoon is a stunning sight and this is of course magnified by the view of Fitz Roy's spires and glaciers. The group returns to El Chalten in the afternoon. Today's hike is a short morning trek following the Pliegue Tumbado trail. After an hour trekking up the hill we'll reach Mirador de las Carretas, an excellent viewpoint of the western bank of the massif with great views of Cerro Torre and the peaks around Mount Fitz Roy. The group takes the bus back to El Calafate where you'll have plenty of time to rest, walk around town and look for a nice place to have dinner. After an early breakfast we board the minibus and start the drive to Los Glaciares NP, driving to Bajo de las Sombras Bay, where we board the boat for a twenty minute navagation on Lago Rico. The ice trek begins near the south wall of the glacier. There are terrific views of the glacier and surroundings. The trek finishes with a little ice bar serving whiskey on freshly chopped ice from the glacier. After lunch the trek continue around the glacier before driving back to El Calafate in the late afternoon. After breakfast transfer to the airport or continue traveling by land.